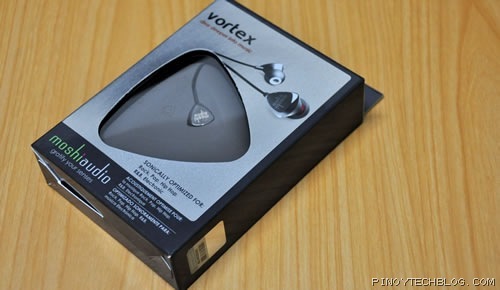 I’ve been trying out this earphones from Moshi called the Vortex when it landed on our lap a week ago. Moshi is more known for its Apple accessories like casings and sleeves more than sound technology. In fact, the Vortex is their only audio equipment at the moment. The Vortex is not cheap at less than Php3,000 so you’re maybe wondering if Moshi can compete with other established brands at the same price range right? Read on for our review. The Moshi Vortex has one unique design with its pyramid-looking earpiece with a brushed metal finish. 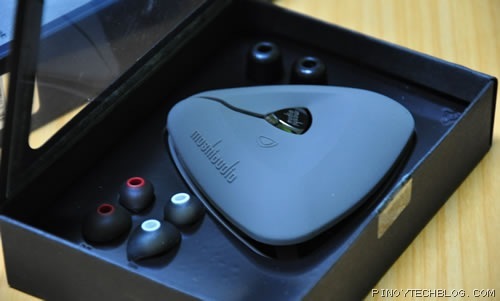 It’s a canalbud type of earphone meaning its a cross between your traditional earphone and in-ear montors. It doesn’t go all the way in your ear canal so it won’t completely block off noise which a lot of people seem to want. It has what they call a RigidBody steel alloy construction that makes the Vortex heavier than your typical earbud when you hold it. But surprisingly, it doesn’t feel heavy once you wear it in your ears. The metal increases bass response and the heft prevents the weight of the cable from pulling it. Speaking of cable, they are wrapped in fabric unlike the more commonly used rubber coverings. Does this prevent tangling? Not really, all it does is make the Vortex feel special. 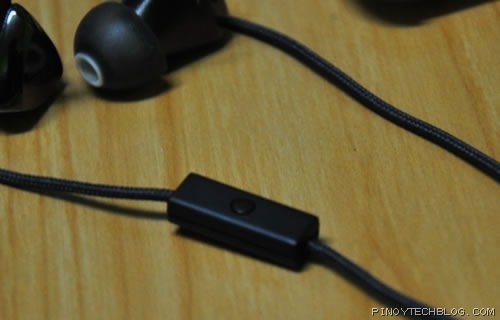 Better wear the cable over the ear to minimize microphonic noise. On the right cable is a mic with a single tiny, button for playback control that’s made for the iPod/iPhone. A single press will pause the music so you can take the call and a click+hold will decline it. Doing a double press will skip your music to the next track. Would be really nice if there’s volume control as well. The button didn’t do anything when I used it on my PC. 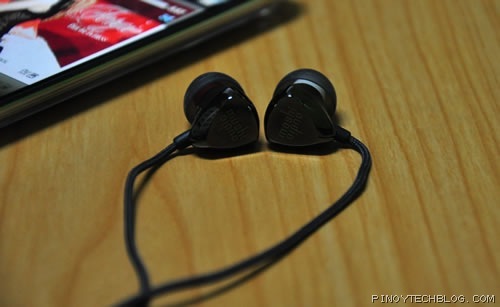 Aside from the three sizes of silicone eartips, there’s also a pair of foam eartips. It also comes with a nice triangular spool to hold your earphones securely and hide the cables when storing. Off the box, Moshi immediately mentions that the Vortex was sonically optimized for Rock, Pop, Hip Hop, R&B and Electronic. I’m not an audiophile but in my book those selection would mean party music with a lot of heavy bass. Looking at my paltry selection of hip hop music, I settled with an oldie, Dr. Dre’s Nuthin’ But a G Thang. Bass part was so solid that it was kinda hypnotizing. Vocals were still clear and crisp and were not overshadowed by the bass. Went with something more heavy and I stumbled upon DMX’s Get It On The Floor. Wow! Bass was really kicking. Low, mid and upper bass was translated cleanly. Time for some party music and we tried it on BEP’s The Time. Nothing special on the first part of the song but right after “œDirty Bit”, boom!, there’s a party going on inside my ears. The bass muddied the vocals though afterward but I’m thinking that’s how Black Eyed Peas made their album. Slowing down a bit using Maria Maulder’s Midnight at the Oasis, Vortex gave me a detached song. 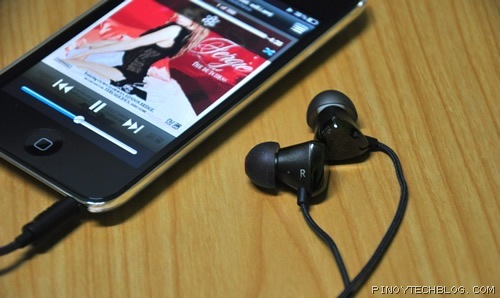 I’m not saying that it’s bad on non-bassy music, in fact, it’s way better than the ordinary cans your iPod came with. I prefer to hear each distinct instruments clearly but with Vortex, it sounds like everything’s thrown out there along with the vocals. I’m looking for the in-room sound that my V-moda Vibe gave me, like you’re inside the room with the performer especially when it comes to my Stevie Wonders. The Moshi Vortex can be a good everyday pair of canalbuds when your emphasis on music is those with lots of heavy bass, hiphop or house music. For classical or acoustic, it sounds fine but there are other cheaper alternatives out there that you can consider. The fit works perfectly for me. I didn’t suffer any ear fatigue after hours of use although I wouldn’t recommend sleeping with these on because of its size which may hurt your outer ear when pressed. I would like for it have a volume control on its inline mic/remote module though. The Vortex is made for lively music and can really give you a party-inside-your-ear listening experience without letting other people inside the elevator know what you’re listening. 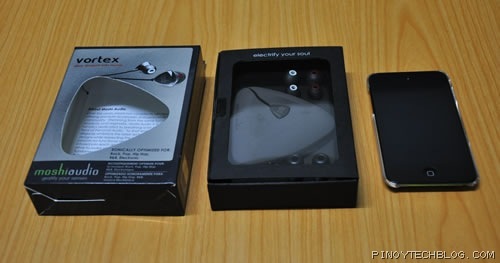 The price of Php2,950 is just right for the sound quality if produces (again if you’re into bassy music) but there are other high quality earphones made specifically for bass-music out there which costs less. The a-JAYS Two comes to mind but it doesn’t have an inline remote/mic unlike the Vortex. If you wish to check out the Moshi Vortex, they are available at Digital Walker/Digital Hub.